Save yourself years of painstaking work by buying this ready made topiary specimen! Perfect paired up with an eye-catching decorative pot for a wonderful centrepiece or in pairs by doorways, gateways and pathways. The lush deep-green foliage is tinted bright-lime green on new growth. Easy to care for, Thuja occidentalis 'Smaragd' or Emerald Cedar is dense and slow growing so keeps its shape well. Delivered as a mature pruned plant in 10L pot. Feed regularly during growing season. Save yourself years of painstaking work by buying this ready made topiary specimen - already crafted into a dramatic '3 ball' shape by expert nurserymen! 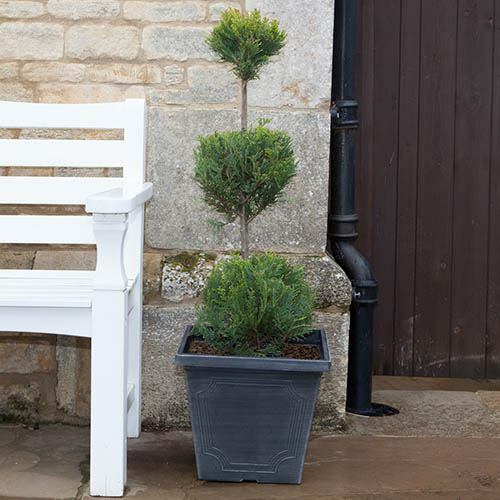 Creating a real show-stopping feature, this topiary cypress is the perfect plant to grace a handsome pot and place by patios, terraces or in front gardens as a centrepiece, or plant in pairs and place either side of doorways, gateways, pathwys and entrances, bringing the plantsmans art to your garden to be admired for years to come. This form of Thuja occidentalis 'Smaragd' or Emerald Cedar as it is more commonly known, is dense and slow growing so keeps its shape well once trimmed. Easy to care for, there's really very little to do, just give an occasional light trim to maintain the shape to your taste, taking particular care to remove shoots from any bare stems. It will really flourish in a both a sunny or lightly shaded spot. Easy to care for, there's really very little to do, just give an occasional light trim to maintain the shape to your taste, taking particular care to remove shoots from any bare stems. Your topiary will really flourish in a both a sunny or lightly shaded spot. When potting on, use a high-quality soil-based compost that contains perlite or vermiculite to retain moisture and improve drainage. Water frequently to keep the soil moist - plants are fairly drought-tolerant when planted in the ground, but they dry out quickly in pots. When pruning, just snip off the tips of the branches - don't prune back to old wood as the plant won't put out new growth. Feed every three to four weeks during the growing season with an all-purpose, water-soluble fertilizer.